WebGoonies.com - California Trip - Update #5 - Not Everything was Magical. California Trip - Update #5 - Not Everything was Magical. Written on January 12, 2006 by Kevin. 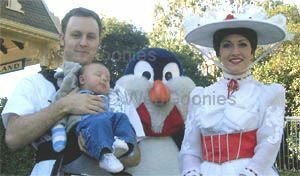 Yesterdays post was about the Disneyland Baby Care Center and while it was a wonderful place, there was one negative that I left out. In fact I left out a few negatives with taking a young child to Disneyland. Disneyland has only one care center. What does this mean you ask? Disneyland is huge and when you are one side of the park, it is not fun to have to walk back to the center, just to feed. While it is nice to catch a seat and take a moment to relax, its still not fun to walk the distance when you could be out doing something better. Rylan did really well the first part of the day and slept for the most part. When it began to get later in the day and darker, Rylan just wasn't the same. He decided to have one hell of a fit with him strapped to my chest. I stood there waiting for my wife while Rylan screamed like I was murdering him. I do my best to comfort him the best that I can but it just wasn't enough. After looking around, I notice that 30 people or so are staring at me like I have done an ungodly act. Obviously they were wanting me to shut the baby up but as a parent, you soon realize that is not always going to happen as fast as you want. My wife then took him into the bathroom to get changed in which case he was fine with. After taking him back outside into the dark, he goes crazy again. Our guess was that the combination of darkness and the crazy lights, simply scared him. Quite possibly the most difficult thing with taking Rylan to Disneyland was trying to eat. If you have ever had a child strapped to your child and attempted to eat, you understand what I went through. I had to bend my body in unimaginable ways to be able to eat without dropping food onto Rylan's head. Hours before, I had dropped a chocolate chip from a granola bar and ended up finding it melted on his ear. My suggestion if you are going to eat with a baby on your chest is to choose wisely. Choose something on the menu that is not going to be as messy as a Po' Boy sandwich. The Snugli, did its job well, allowing us to hold Rylan without the need of a stroller. This came with a price however. The Snugli was strapped to me for about 14 hours and began to take its toll. I would have thought it would be in my back however the pain originated in my shoulder. One shoulder more than the other, likely because Rylan was leaning towards that side. While the pain was certainly bearable, it wasn't fun. I imagine the stroller would be necessary for future trips as Rylan continues to grow.